The seers have foreseen that the first DLC pack for Kingdoms of Amalur: Reckoning is fated to deliver new characters, towns, dungeons, and weapons. Appropriately enough, developer Big Huge Studios likes to deliver big, huge, games. 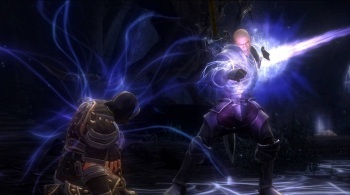 Not content with creating Kingdoms of Amalur: Reckoning, which can last anywhere between dozens and hundreds of hours, it will soon provide an impetus for players to return to the war-torn land of Amalur - or visit it for the first time. The Legend of Dead Kel, the game's first DLC package (unless you count Curt Schilling's "buy new" incentive), promises a dragon's horde of new content, but players will have to wait till March 20, 2012 to see for themselves. The Legend of Dead Kel will take players to Gallows End, a mysterious island that holds a brand new quest line, multiple side quests, a type of dungeon called "Dverga Fastings," three Twists of Fate, and a handful of previously unseen armor and weapons. Players will also have access to Gravehal Keep, an estate housing a number of backstory-laden characters just itching to unload their troubles on unsuspecting adventurers. The content is also platform-agnostic, and will be available for Xbox 360, PS3, and PC via either Steam or Origin. While no price has been set for the DLC yet, it may be a tough sell. By all accounts, Amalur offers a pretty significant amount of content for $60, and there can't be that many people who will have played through every quest or seen every area by March 20. Will players who put the game down (either out of completion or satiation) be willing to drop more money on it for new content when they haven't even finished all the content that came in the box? It will depend, of course, on the DLC's unique qualities and whether or not the titular Dead Kel has anything to do with a beloved 90s sitcom character.